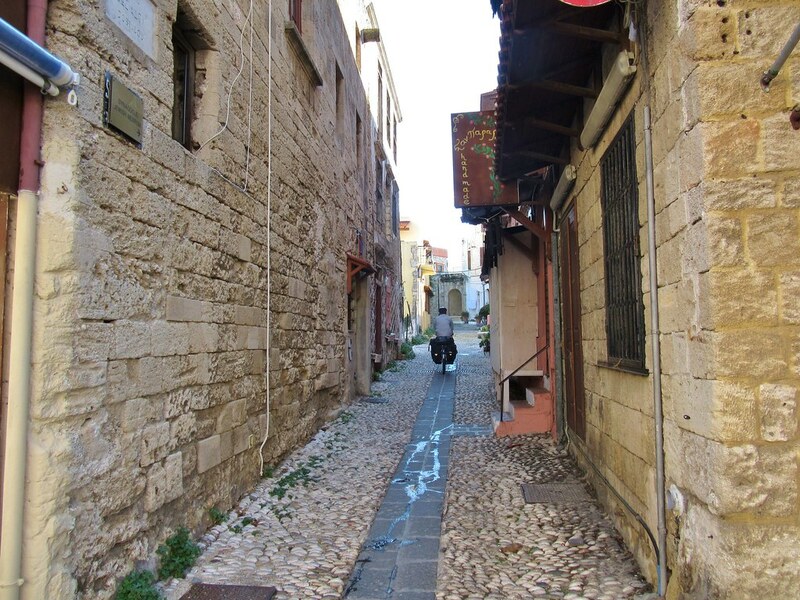 They had rented a car, which we piled into to explore a bit of Rhodes. 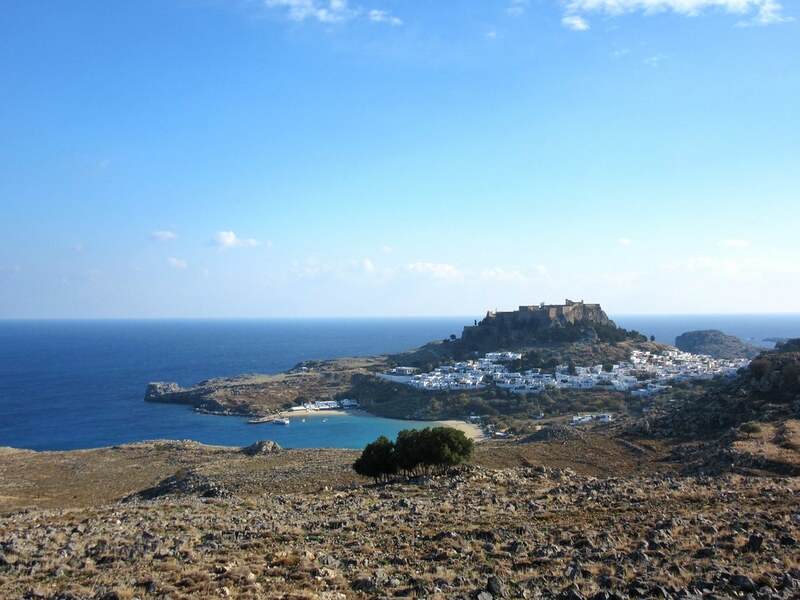 Up to the old town, or down to Lindos for a wander and some lunch. We probably could’ve seen more of the island, but we were happy just relaxing and making the most of having such a nice place to call home for a while. The bikes were long overdue some attention and they weren’t going to clean themselves, so I spent an afternoon degreasing chains and getting my hands dirty. We did a bit of cooking too, which hopefully went some way towards earning our keep, but we really should say how grateful we are to Clare’s family for their kindness, and how much we enjoyed Christmas with them. 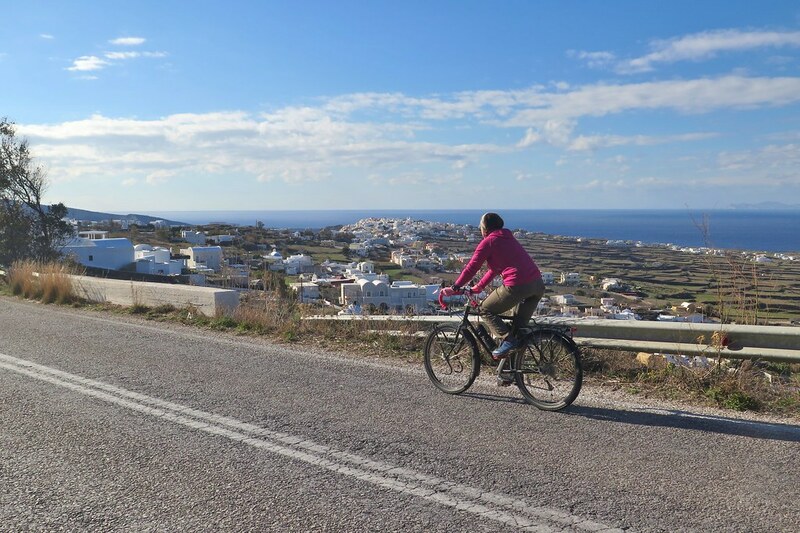 The time went quickly, and before we knew it they were heading back to the airport and we were back on the bikes retracing our steps to Rhodes town just the two of us. We had decided to stay for a couple more nights on the island, so got an Air BnB in Rhodes old town. The touristy area was really dead, with very little open at this time of year. We walked a bit more into the newer part of town which had much more going on, so we weren’t totally bored. 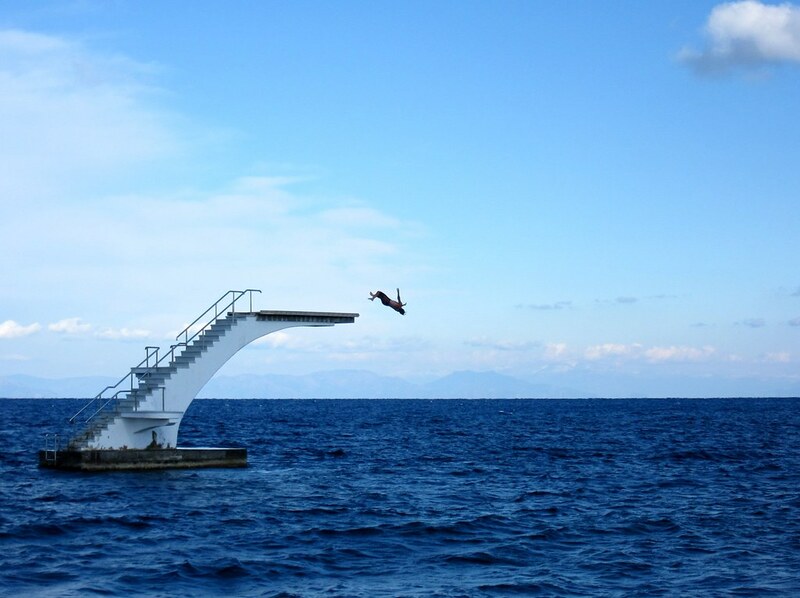 I spotted a diving board on the rocks just off the town’s main beach which was just too tempting, even on a cold day. A floaty backflip, and the crowd went wild. (There wasn’t a crowd, just Clare patiently waiting on the beach for me to grow up.) New Years Eve was low-key, a nice meal and some wine, then we just about made it to midnight. Bring it on, 2017! 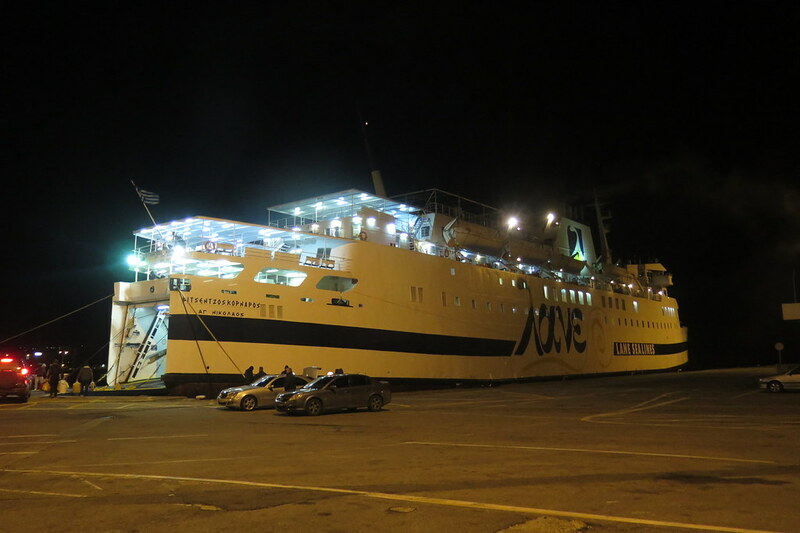 Then, on the 2nd we were up early, a 4am alarm, to catch the ferry over to Crete. The boat sailed out of port just after 5 o’clock and we drifted off to sleep, stretched out across a row of seats in a half empty cabin. When we woke up to daylight, we looked out the window to see we were stopped in a port. A port that looked very familiar. It turned out we had returned to Rhodes with engine trouble and were waiting for the engineers to fix the problem. We waited all day, and then overnight on the boat, until the next day at 11am we finally left after a 30 hour delay. The harbour in Rhodes really is beautiful, but we were very happy to see it disappearing behind us. 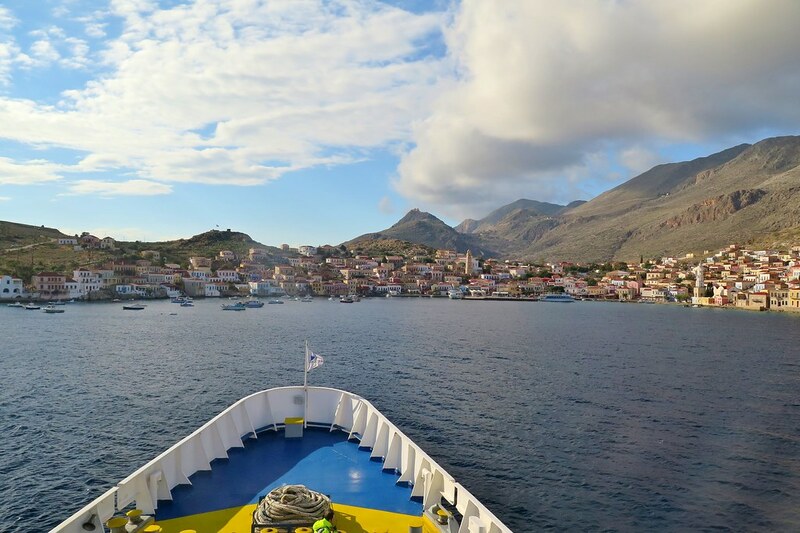 The ferry took 18 hours to get to Heraklion, Crete calling in at a number of unknown small islands on the way. 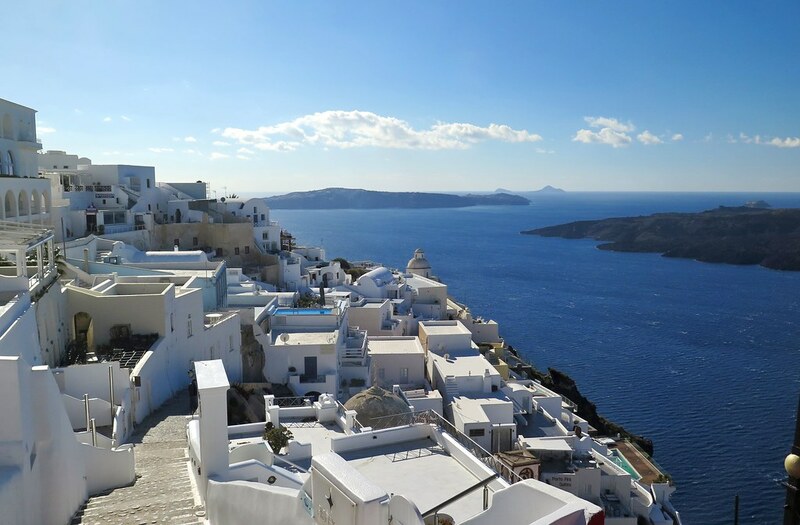 Some were really picturesque, especially in the good weather, getting us very excited for the island hopping we’ll be doing in Greece for the coming weeks. 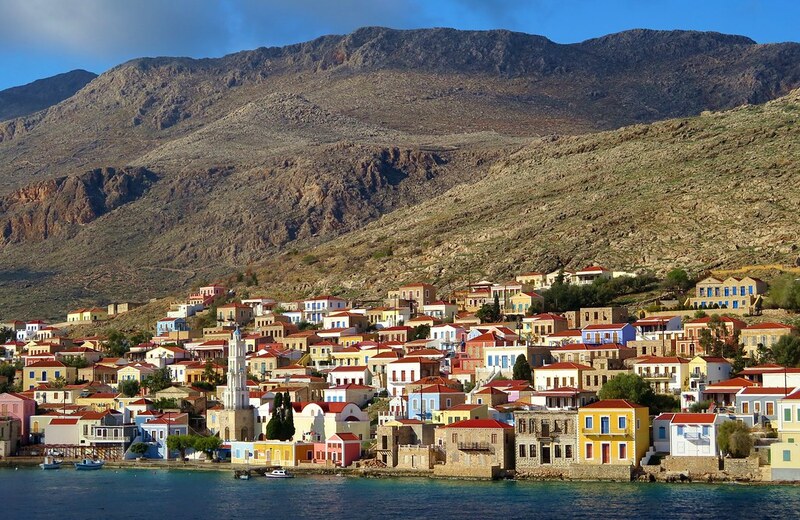 The photos below are of Halki, just off the south-western tip of Rhodes. Another night on board then, after 48 hours on the ferry, we rolled off on to Crete at 5 o’clock in the morning. It was still a good two hours until sunrise and all the port buildings were closed up. 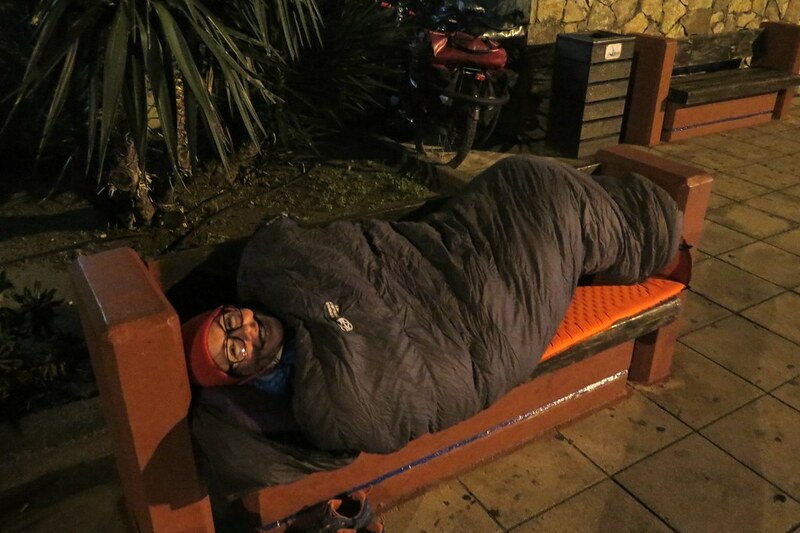 We didn’t want to set off riding in the dark, so we stretched out in our sleeping bags on a couple of benches to try and get a bit more sleep. It didn’t really work as within an hour two huge ferries arrived, so there were cars and trucks lined up next to us waiting to load. We packed up and cycled into town where we found an open cafe to wait in. While we had wifi, we checked the weather forecast, which didn’t look too promising. 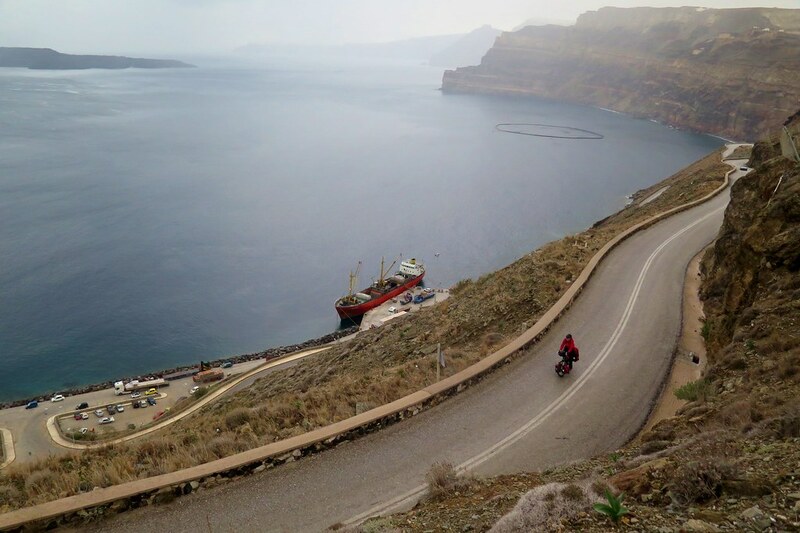 We were planning to ride a route which took us over to the south of the island and along the southern coast, and east to Sitia where we wanted to catch the next ferry. The forecast showed strong winds, rain and the chance of some snow. We’d also lost a day, thanks to the long ferry delay, so we had a bit of a rethink. 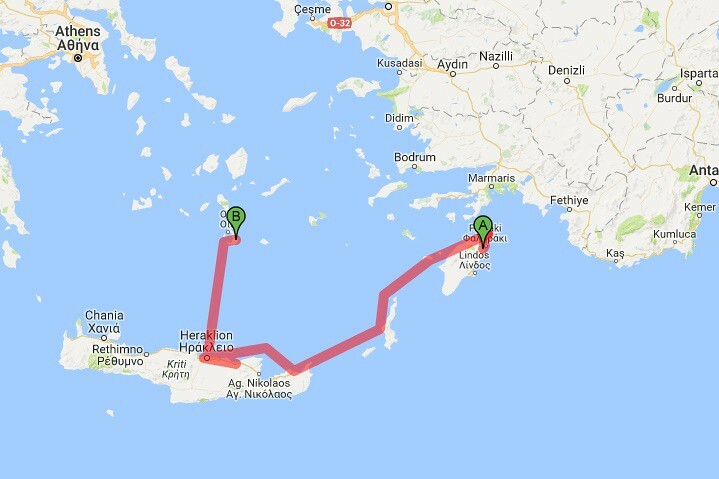 We set off to the east, aiming to cross the mountains in the middle of the island if the weather looked ok.
Once we were out of Heraklion, most of the traffic stuck to a main highway and we took the quieter road that followed the coast. It was nice to be riding again, even if was slightly harder on the legs after an indulgent Christmas. We rode through quiet tourist towns and past empty beaches, stopping on one for lunch. It was a couple of degrees warmer here than in Rhodes as we’d come a fair way south on the ferry. There were dark clouds rolling in though, and we were feeling quite tired after not a lot of sleep in the previous 48 hours. 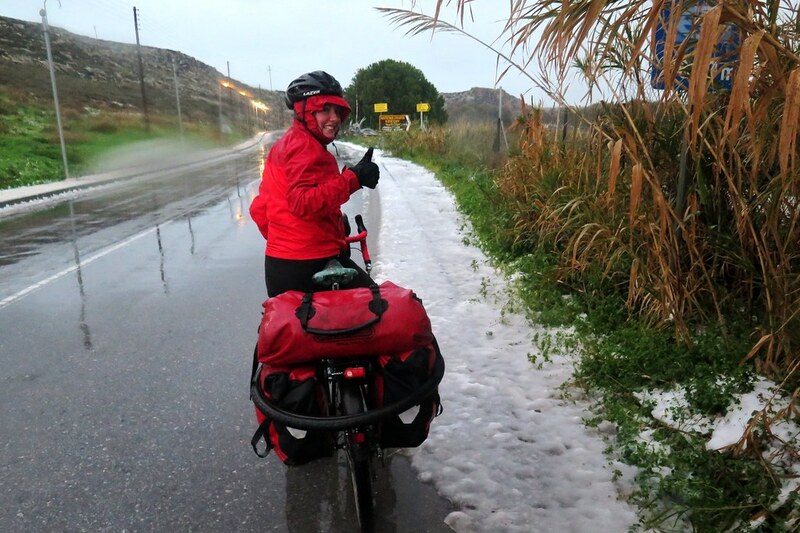 By the time we reached Anissaras, a suburb of Malia, it was raining and we were ready to call it for the day. Thanks to off-season prices on booking.com we found an apartment for 12 euros a night. We got ourselves into the dry and had a very early night, planning to continue in the morning if the weather looked better. But the weather didn’t get better. It was stormy overnight and pouring with rain in the morning. 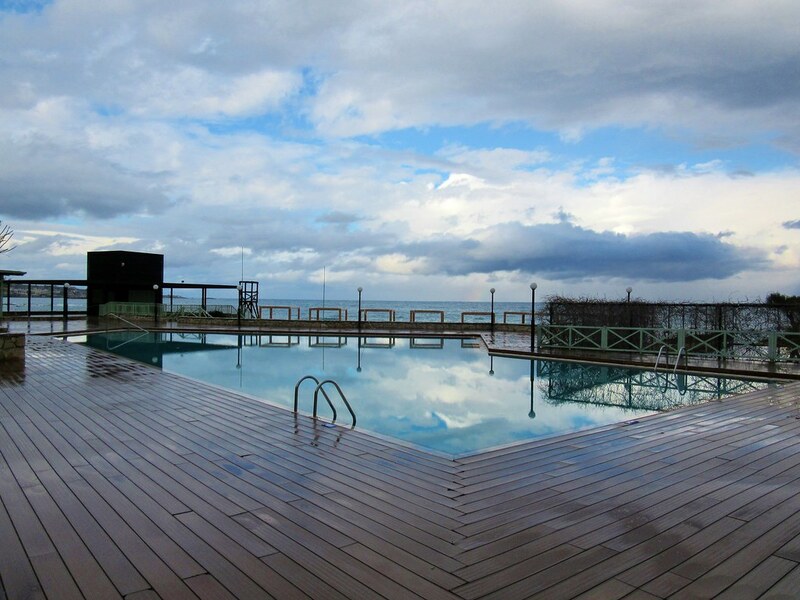 We extended our stay, for one, two then three nights as the rain stayed over us and the temperatures plummeted. Our winter break was turning out to be longer than we thought. We hibernated, with daily excursions, if there was a break in the rain, to walk along the beach past the empty hotels and pool bars to the supermarket. 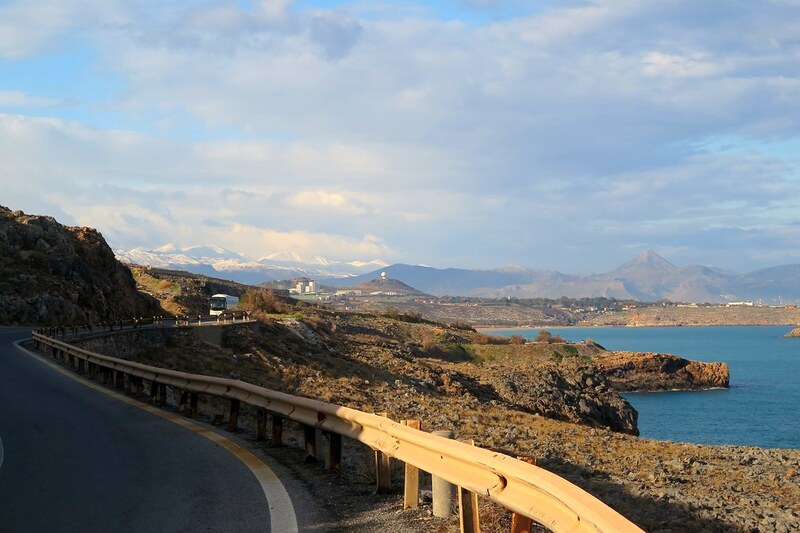 It was a shame that Crete was to join Azerbaijan as a place that would’ve been really nice, if the weather had been better. 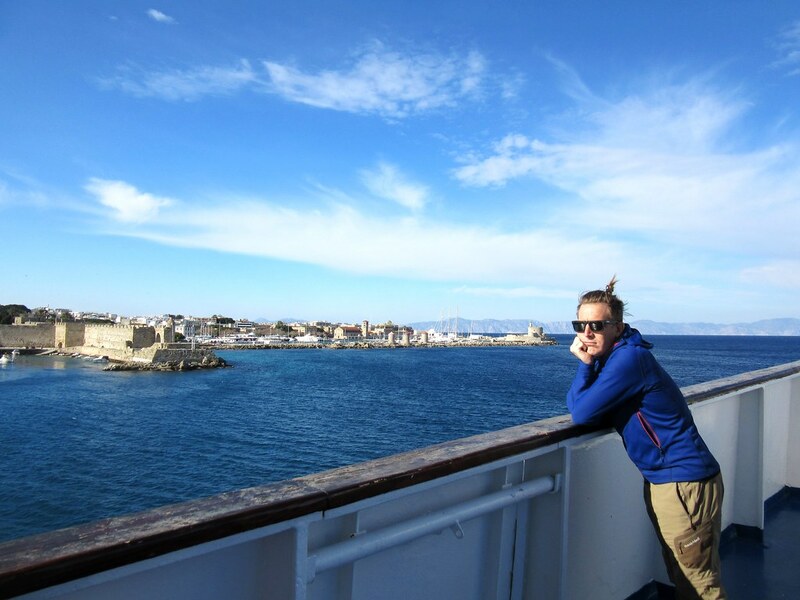 In the end, we decided we’d head back to Heraklion to catch the ferry onwards to Santorini. But we had one last bonus in store – on the day we were due to leave, snow started falling. 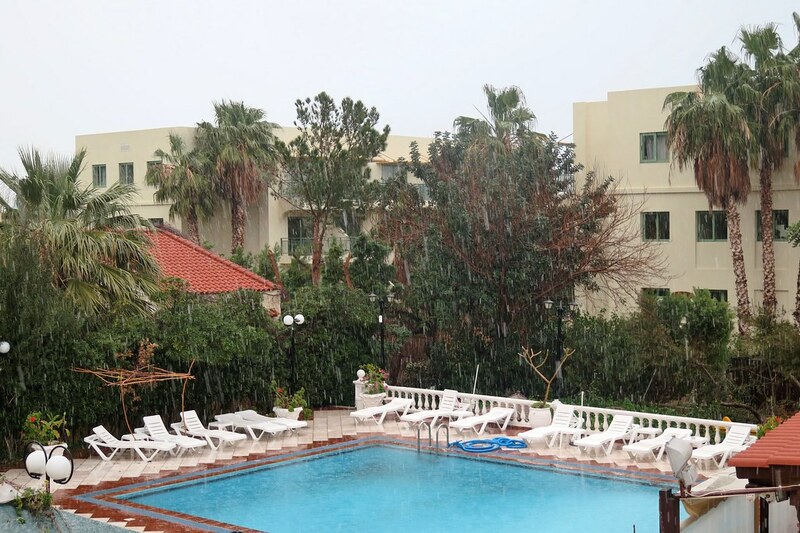 According to the locals and the constant news reports, it never snows down to sea level in Crete. 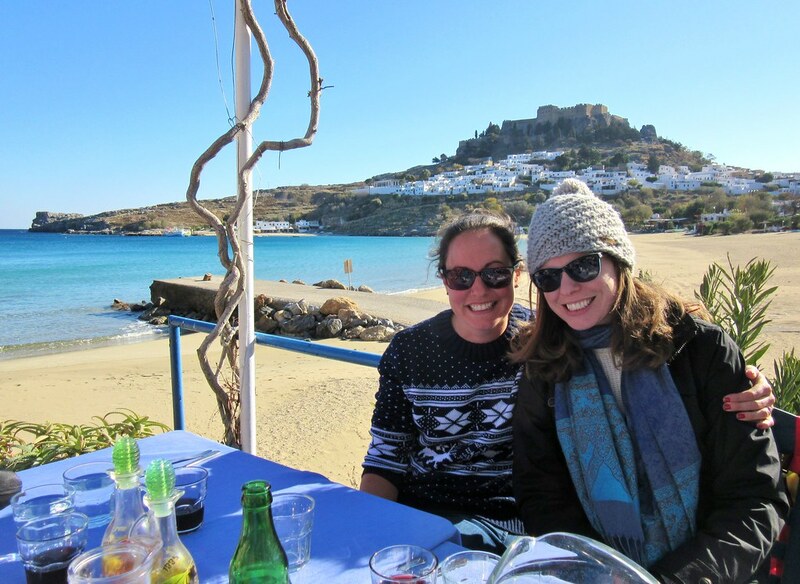 So far, our plan of avoiding the cold European winter down in the Greek islands wasn’t exactly going as we’d hoped. Our ferry was due to leave in the evening, so we left it quite late to ride to the port, hoping that the rain/sleet/snow would ease off. 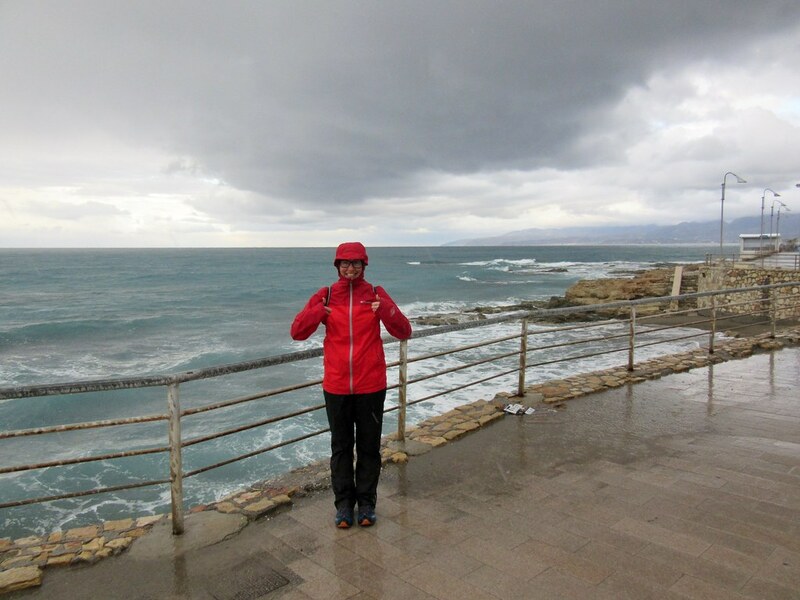 In full waterproofs, we retraced our steps along the coast, with wet slush lining the roadsides. 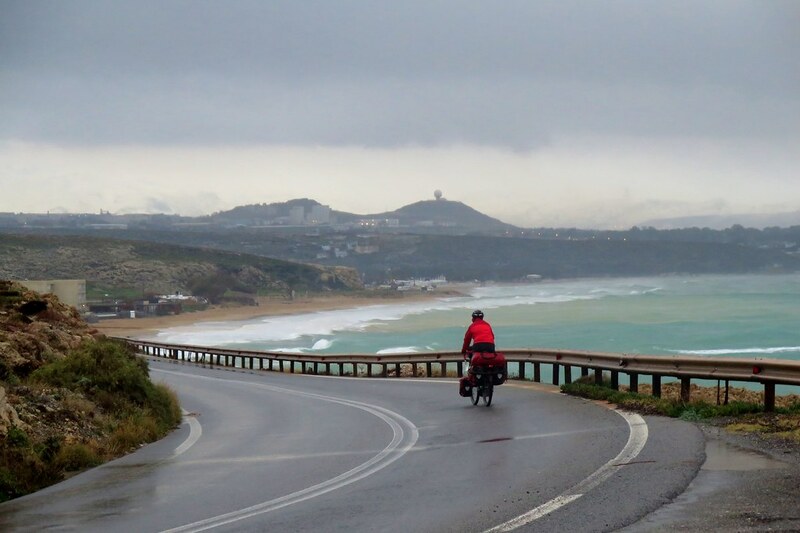 A few kilometres before we reached Heraklion, and as it was getting pretty dark, we had a steep climb up onto a headland. As I changed gear, down to my smallest chainring, I heard a crack and my pedals span away from my feet. I knew before I looked, my chain had snapped. Why now!? Luckily we had a spare chain, with a SRAM link which made it easier to change by the side of the road. We got it done fairly quickly, hiding in a bus shelter, but even so, my fingers went numb very quickly and remained so for the rest of the ride to the port. When we arrived we got the good news that the ferry was delayed, so the new departure time would be approximately 5 o’clock the following morning. They were keeping the passenger terminal open overnight though, so we wouldn’t need to sleep outside on the benches as we did when we arrived. We found a dark corner and lay out our thermarests on the floor with alarms set early and managed to get a little bit of sleep. We slept a bit more once we were on the boat, which left at 6am and made a couple of stops before reaching Santorini soon after midday. The clouds were low and it was still raining as we docked. The cliffs around us looked very imposing, a dark wall of rock looming above us. 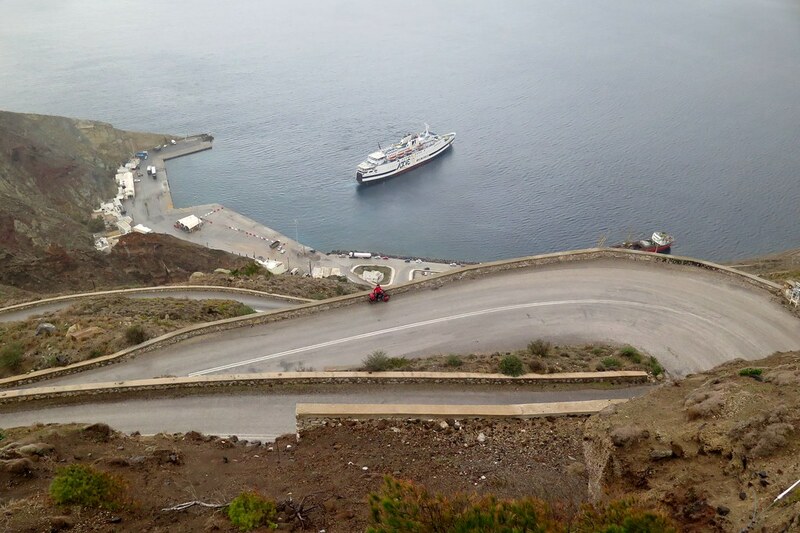 To get up on to the island, the road from the port climbs 300 vertical metres in under 2 kilometres through 7 hairpin bends. It was a spectacular but tough start and we arrived at the top exhausted and sweating inside our waterproof jackets. We stayed in Santorini for three nights, and we finally got some good weather! 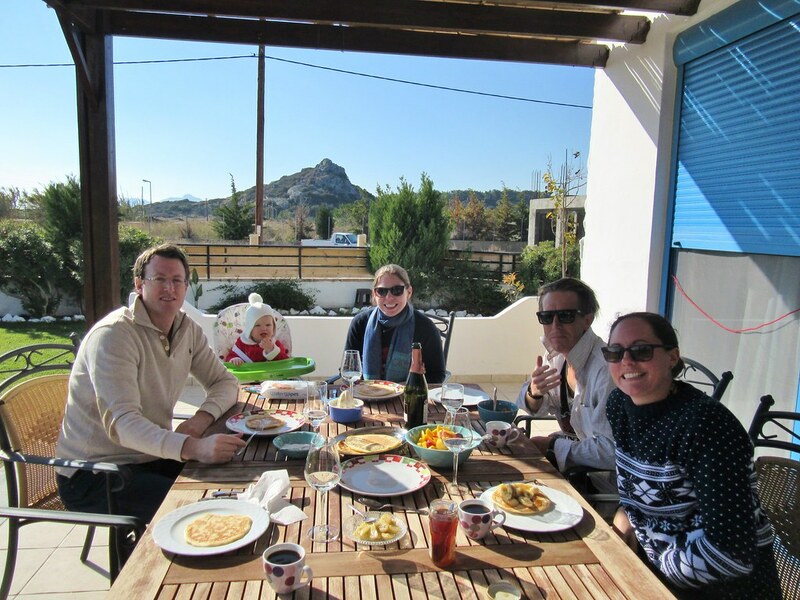 I’ll admit, morale was taking a hit with all the rain, especially after such a good time in Rhodes for Christmas. We had been thinking about other options to avoid the rain and cold, even to the extent of looking at flights to Sri Lanka! 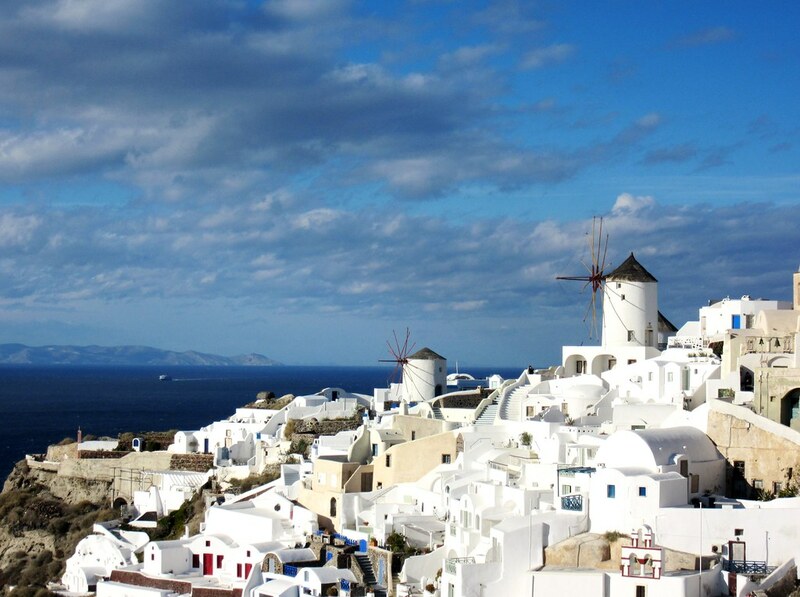 But a couple of good days in Santorini boosted our spirits considerably. 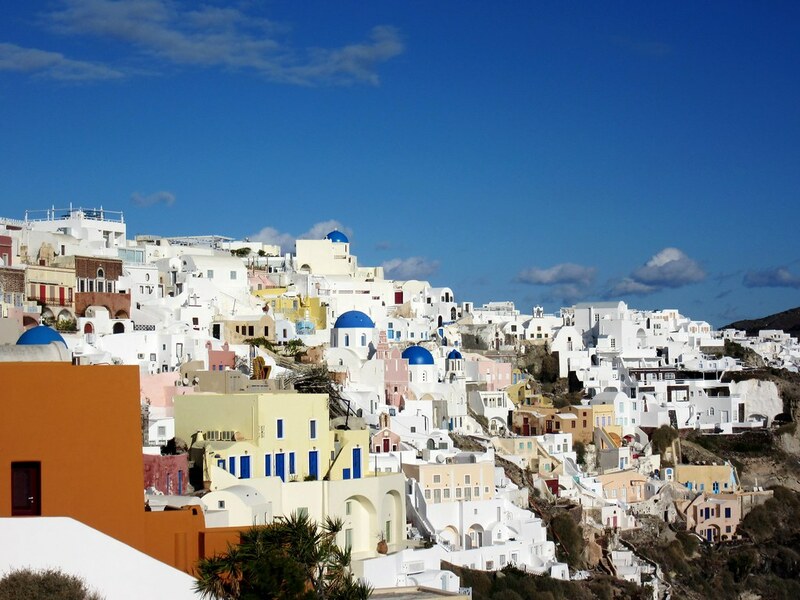 On one day we walked around Thira, the biggest town on the island, famous for its white buildings and domed churches. 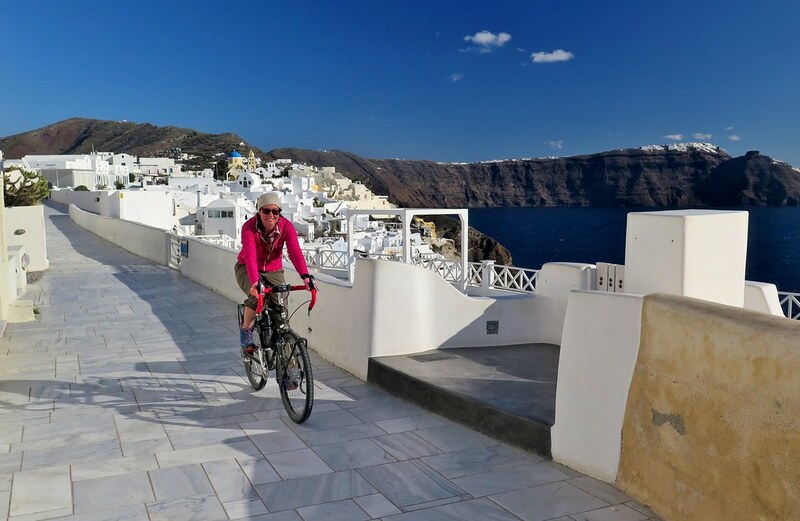 The next day we got on the bikes for a ride out to Oia, perched on the cliffs on the northern tip of the island. It was a nice ride, steep in parts, but an enjoyable 35km out and back. 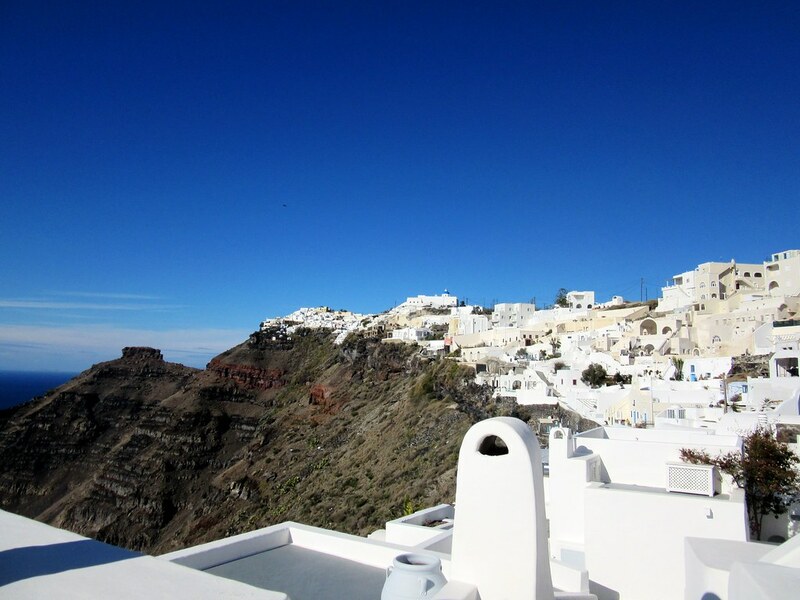 We found Oia even more spectacular than Thira, with views down to the sea in all directions. We locked up the bikes and went for a walk through the narrow alleyways running between the houses, churches and windmills. The alleys led down to an old fort, where we could see the whole town sloping down to the sea. 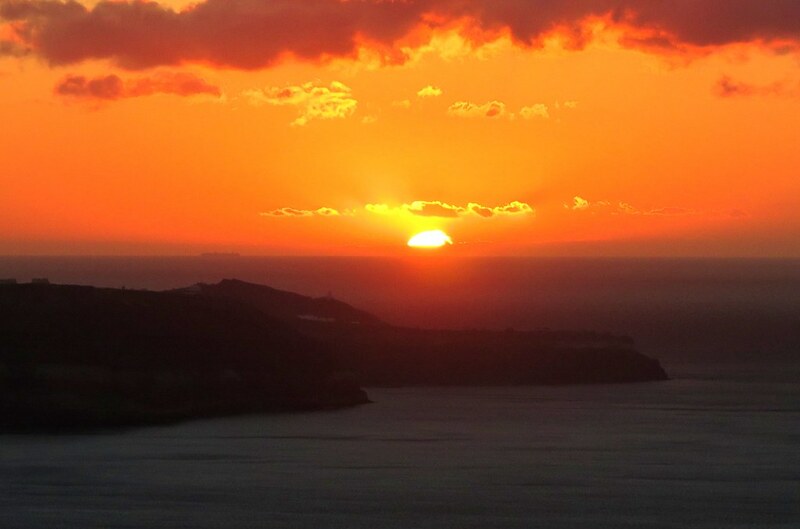 This is the famous sunset viewing point where tourists line up to get the perfect photo, careful to avoid getting any other tourists in the frame. We would’ve stayed to watch the sunset ourselves, but we didn’t want to ride all the way back in the dark. 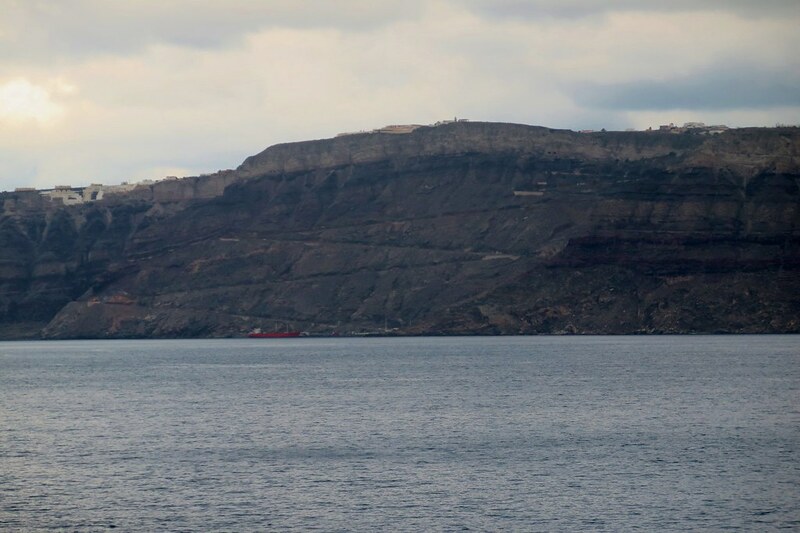 Instead, we headed back past Thira to a spot we’d seen earlier in the day. 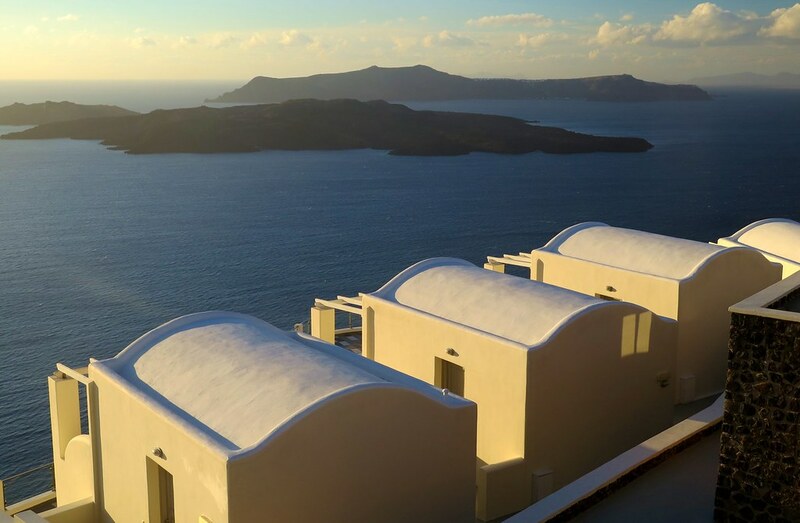 We sat on the wall of some very fancy looking, but empty villas which hung to the cliffs high above the sea. 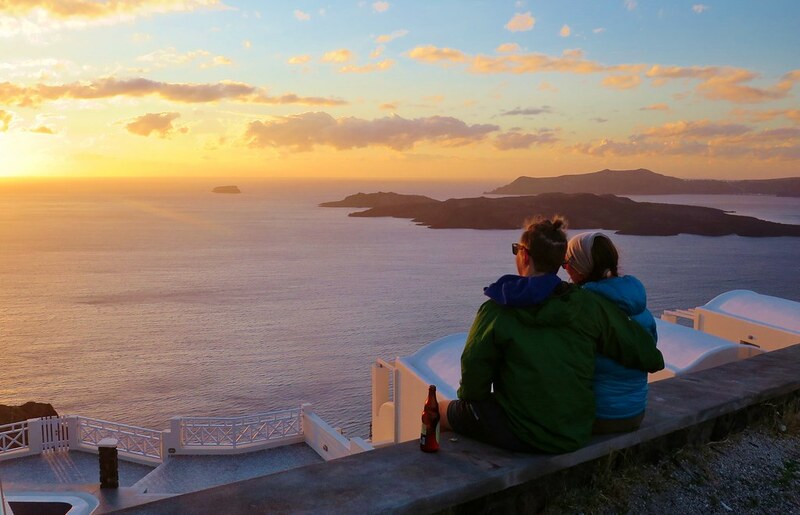 With a couple of supermarket beers, we watched the sun setting into the sea over the small volcanic islands in the middle of the caldera. Great to know that the ferries do run often even in off season. We were told in the past that the frequency is dialled down. Is that true? Really useful read! 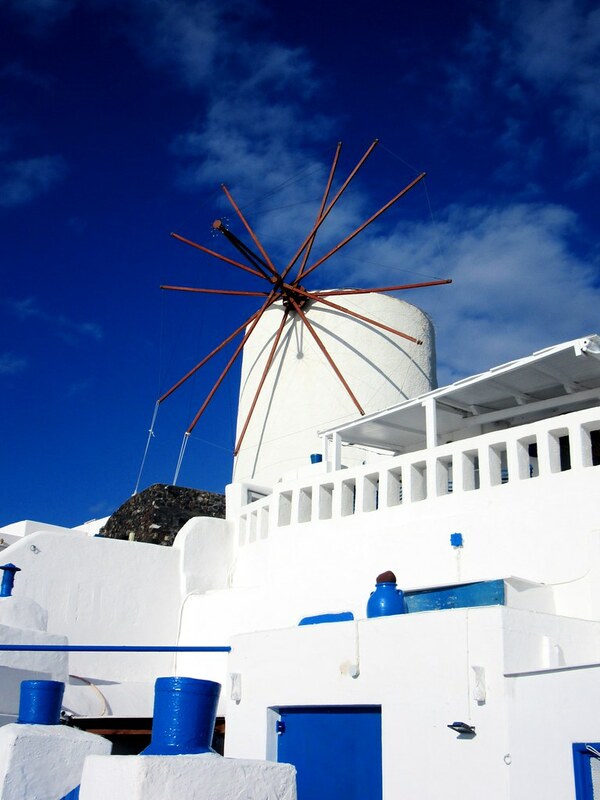 I’m heading to Rhodes in July and hoping to take the ferry to Santorini! Glad it was useful! Openseas.gr is a useful site for timetables. I’m sure you’ll have much better weather than we did!